If you’re looking for blue diamond rings for a wedding or a gift, you have exquisite taste. Blue diamonds are considered one of the rare gemstones, making them a highly coveted and cherished item to add to any gemstone collection. All blue diamonds have a blue tint to them, but those with the deepest blue hue are considered the most rare and expensive to purchase. If you’re seeking larger blue diamond rings, they will be even harder to come by. "The Art of Bulgari: La Dolce Vita & Beyond, 1950-1990," is a real treat for any diamond and gemstone enthusiast. The show, which features 147 different pieces and showcases the work of the Italian jewelry house over four decades, includes pieces from the post-World War II period, during which Bulgari became a major player in the world of jewelry design. In the many years to follow, Bulgari continued to thrive, constantly reinventing its image as a company and coming up with amazing new concepts, such as the use of rounded gemstones and mixed color combinations, including blue diamond rings. Many Hollywood starlets have fallen in love with Bulgari jewelry over the years, including but not limited to Ingrid Bergman, Elizabeth Taylor and Sophia Loren. Aside from the main jewelry pieces, the exhibit also features seven different pieces that were once owned by Elizabeth Taylor herself. If you’re in the market for blue diamond rings, you will be plenty inspired by what you see at this amazing show, which is being held at the San Francisco de Young Museum in Golden Gate Park. The museum hours are Tuesday through Sunday, 9:30 a.m. through 5:15 p.m. On Friday nights, the museum stays open until 8:45 p.m. Admission is $20-22 for adults, $17-19 for senior citizens, $16-18 for college students and $10-12 for children up to the age of 17. General admission is completely free on the first Tuesday of each month. 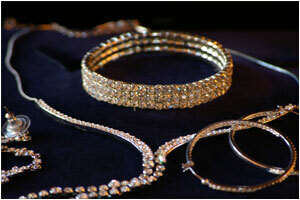 After getting a taste of the exquisite at the show, come on over to Juno Jewelry and pick out a beautiful piece of your own. Whether you are looking for engagement rings, wedding bands, promise rings, necklaces or any other form of jewelry, Juno Jewelry has what you need. Our in-house jewelry artisans are committed to crafting high-quality pieces that demonstrate an air of luxury and refinement. We use only the best raw materials from sustainable sources to ensure that each piece will remain beautiful for many lifetimes, enabling you to pass down your most cherished items to your children and grandchildren. Every item purchased at Juno Jewelry comes with a certificate of authenticity, and we have something to fit with every possible budget. Give us a call today!